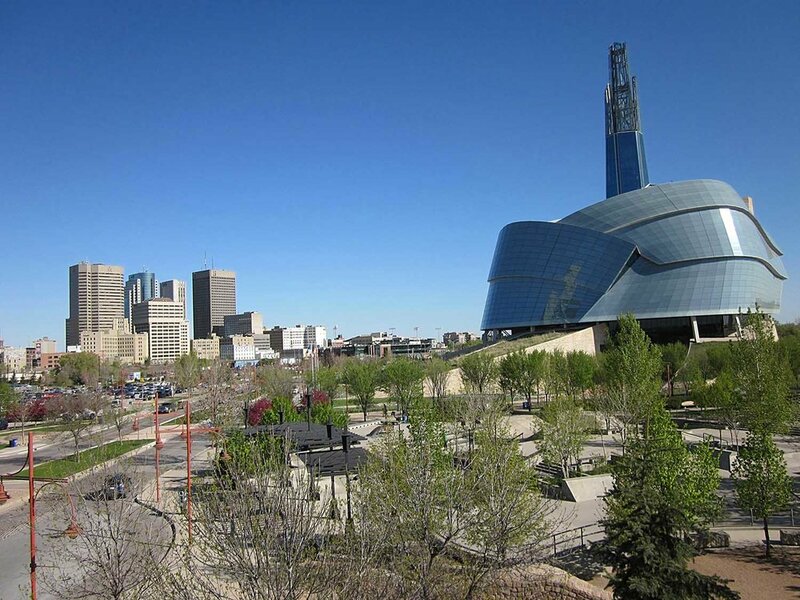 Winnipeg is home to the Canadian Museum for Human Rights. It’s an impressive piece or architecture, and if you ever get the chance, I would highly recommend a visit. It’s a difficult walk, but every time I’ve gone, it has reminded me of the many horrors that have occurred when we’ve violated each other’s human rights. Human rights are an interesting concept. They keep coming up in my world. I’m often at rallies or events where speakers try to appeal to our humanity to do the “right thing.” The language that is used includes “universal,” “self-evident,” and “inherent.” The idea is that there are certain rights that we all have, rights that we can claim for the simple reason of being human. But there’s a trend in our culture these days. For a society that’s becoming more and more secular, North Americans are also becoming increasingly moralistic. Church attendance is declining and fewer people are labeling themselves as “religious.” But political movements to respect human rights continue to blow up the internet. The problem isn’t that people want to see good change happen. Movements like Black Lives Matter and MeToo are important; reconciliation and climate change discussions are necessary. People want society to recognize human rights, but it’s interesting that we would try to talk about such rights outside of the context of a Creator who gave them to us. Here’s the thing: we can’t deny the existence of God and still believe in universal human rights. We must either recognize that there’s a God who sets the standard for morality because He is the creator of the universe, or we must accept that there’s no such thing as inherent human rights. Why are those the two options? Let me explain. Universal human rights assume that there’s an objective right and wrong, that people at all times and places have these rights simply because they are human. But where do these rights come from? If we say we made them up, then they aren’t objective or universal. As “obvious” as those rights may be to us, they are only ever subjective, and definitely not inherent. Let’s use physical violence as an example. You may believe that it’s inherently wrong for me to punch you in the face. If I punch you, you might tell me to stop because it’s wrong. “Says who?” Well, the courts say so because our community believes each human being should be treated with respect and dignity. Physical violence is an abuse of that right. If that’s where we stop, then the answer to the question of authority is ultimately us. It becomes contextual in that not all people throughout time and space would agree with it. Who is one person to declare a right over another? If you can make your own morality, shouldn’t you allow me the right to do that for myself? If we refuse the possibility of a divine being who stands outside of time and space, then human rights simply become our rights, declared by us because of what we think is morally good. And if that’s the case, we can’t possibly expect to call those rights inherent or universal, let alone expect someone else to subscribe to them. And what happens then? Well, if I punch you in the face, you may be able to get me arrested because I physically assaulted you. In Canada today, the law would be on your side. But what happens when the law isn’t on your side? What if the law actually allowed me to punch you because you were a different race than me? What if, because we lived in a different country or because my political leader told me to do it, there was no consequence for punching you? Without universal and inherent human rights, we have no objective tool to deal with evil in our world. And without God, we have no universal or inherent human rights. We wouldn’t be able to claim inherent human dignity, the goodness of creation, or the equality of all humanity. Now, I do have sympathy for people who reject God because some Christians have misused their power to violate human rights. So many people think of Christians as being hateful, judgemental, and hypocritical. If that were my experience of Christians, I’m not sure I’d want to get to know their God either. But bad Christians do not negate a good God. In fact, it’s only because God exists that we can objectively say that some of the acts of the Church were wrong. The Christian faith has always claimed that it’s God who gives us inherent dignity and worth as the creator of the universe. The whole world, in fact, represents the goodness of God. Our task is to discover and live into God’s invitation to relationship. The moral fabric of that relationship is love. God is about saving, redeeming, transforming, preserving, accepting, and renewing. If we did a little digging, we would discover God’s fingerprint all over the Canadian Charter and the UN Declaration of Human Rights. We may even realize that God’s moral fabric is inherent in people, whether they believe in Him or not. We call that a conscience. God’s objective morality isn’t something we need to be afraid of because in it we find true universal and inherent human rights. As we strive to see human rights respected in our broken world, may we remember from whom those rights come and that the power of that message can change the world.